I know, it is unseasonally warm for the end of March – for which we should be grateful – but everything is in a state of total confusion with buds developing on plants that really shouldn’t be showing any sign of activity till late spring or even summer. I also have issues with the weather in Southern Spain too where it has not been dark at the end of the day in the slightest unless it is after 9.00pm. It is okay to work to 8.30 pm in Granada and still be able to find the washing line of an evening without the aid of a torch. But now, oh, the clocks went back on Saturday, throwing us all, cat included into quite a muddled mood, and now it is dark when I get up in the morning and then the darkness descends a mere 13 hours later and I can’t find the cat let alone the washing line or work out if it’s time for a drink. I have to catch a plane in this altered time zone, will I ever make it! I have been back in Granada for 6 weeks and have been working on a project that has been and continues to be all consuming. 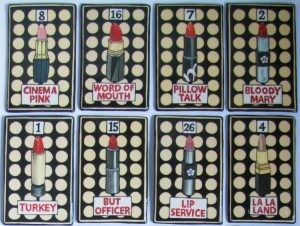 The Lipstick Tablets, collectively known a ‘Painting by Numbers’ is underway. This project which has delusions of grandeur calls itself an installation; it is a collection of 49 tiles, on a theme. Interestingly I told an event organiser about it with a view to show, he said we don’t like grout, we take a dim view of grout. GROUT! I realised then that the word ‘Tile’ was very, very misleading, so hence; ‘Clay Tablets’ (sin grout), this is how we will refer to these very neat, wafer thin, lippy portraits. What I have long suspected is that combining colour with a name (and a number) makes it do things. Add a verb to describe a colour or put it at some location where it assumed an activity, like ‘Cinema Pink’ number 8 for example (Estee Lauder, discontinued) a case of colour in action, or getting some action! I wonder what Revlon was thinking of when they named ‘Fatal Apple’ number 3, which is a red as Snow Whites’ rosebud lips and still a current colour. The first batches are out of the kiln. This work is an investigation into colour, naming and meaning. All my lipsticks are real names, some are discontinued, some have decades of marketing and use behind them, others are brand new contemporary colours. What they all have in common is an explicit language that seems to have been completely forgotten in terms of political correctness. My progress can be followed on Instagram, Facebook and Twitter pages. I don’t know where they will show yet. They are going to be framed individually in a fine Farrow and Ball painted frame. There are to be two of each tile so one is for sale on its own the other stays with the installation. They go with the vase ‘Colours of Disarmament’ finished in January 2017. I have a new website for 2017 too. 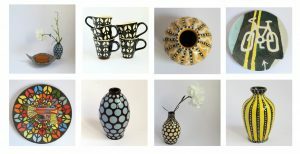 I am delighted that I have an e-commerce shop area so you can purchase smaller items directly from the studio. Website made by Browse Digital who have worked very hard on this site for me. Below are some of the items available on’line to buy. 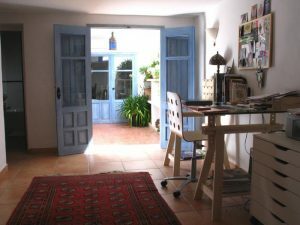 Lastly my small studio in a mountain village south of Granada is available for artists or potters to borrow/share during the summer, it includes a 4 bedroom casita and has a fully equipped ceramic studio. If you are interested please get in contact with me via the contact form on this site or pass onto anyone you think might be interested. It is an ideal opportunity for anyone who wants solitude and the facility and I am usually just up the road in Granada city some 40 minutes away for help etc. I will be at the private view of Ceramic Art London on Thursday night. Instagram, Twitter and Facebook for latest updates.